On a Wednesday afternoon in mid-October, as his college theater buddies plowed through their afternoons in nearby investment-bank offices, Omar Maskati EAS’11 lounged on a well-used couch several stories below Forty-Sixth Street in New York City. With an hour or so until he’d appear in Indian Ink, an off-Broadway Tom Stoppard play produced by Roundabout Theatre Company, Maskati looked nothing like he would on stage. Soon he’d exchange his hoodie and T-shirt for the fez, loose white top and puffy blue pants he dons as the main character’s cook and bottle-washer in Indian Ink. He’s talking about becoming an actor—the career he chose despite an engineering degree and Digital Media Design major. By this past September, when he turned 25, Maskati had acted in an off-Broadway play at Lincoln Center, appeared in guest roles on two network TV shows, filmed scenes for an upcoming indie movie, and blown out his candles alongside Rosemary Harris—the Indian Ink star who shares his birthday—while the Roundabout cast sang to them. That look comes from Maskati’s multi-ethnic background: his dad is originally from Pune, India, and his mom is Puerto Rican. As a result, he’s been able to slip between characters of varied ethnicities: an Iranian named Kareem, a Hispanic teenager, a Pakistani-American Muslim who goes by Abe, and in Indian Ink, an Indian houseboy from the 1930s. Shortly after his final anti-bullying performance, Maskati auditioned for Disgraced—a Lincoln Center Theater play about a successful Pakistani-American lawyer named Amir who is distancing himself from his cultural roots. 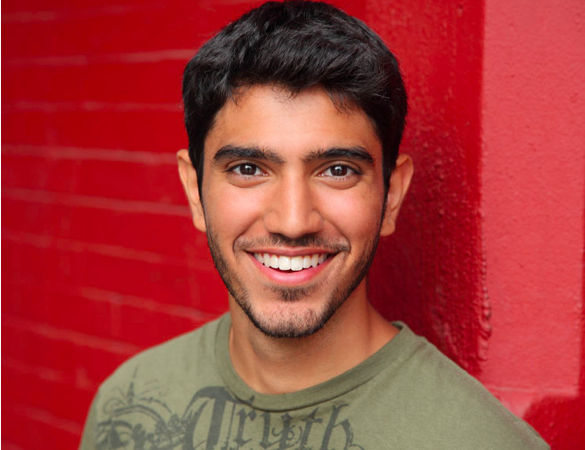 Maskati was cast as Amir’s young and “very Americanized” nephew, Abe. The show’s run was extended twice, its playwright won the Pulitzer, and it opened on Broadway this past October. That role was the tipping point, he says now: it required him to join the Actors’ Equity Association and helped him find a manager, which led to more auditions, a small movie role, Indian Ink, and TV guest spots on NBC’s Believe and CBS’s Blue Bloods. Maskati says his best part to date was Rahim in Modern Terrorism, or They Who Want to Kill Us and How We Learn to Love Them—a play he did at the Contemporary American Theater Festival in West Virginia. It’s about three people who want to execute a terrorist attack on the Empire State Building. And it’s a comedy. MFA or not, Maskati did study acting at Penn, both in classes (he has a theater arts minor) and with Mask and Wig. He spent four years with the all-male comedy group, playing one of the princesses in the annual “Tuition” number, serving as chairman his senior year, and frequently putting his tap-dancing skills to use.